At least one course release "buy-out"
The precise scope of editorial office support will be negotiated by the finalist, his/her institution, and the Publications Committee. The review process begins Feb. 1, 2019. Finalists will be interviewed during the MSS Annual Meeting, April 17-20, 2019, in Chicago.Learn more about the position, application process and requirements here. …is currently edited by the TSQ editing team at Colorado State University, including Michael Lacy and Prabha Unnithan. The Journal Manager is Chris Moloney. Reference TSQ author guidelines before submitting your manuscript. Submit a manuscript for publication in TSQ. Are you a member and don’t have an online access code? Contact MSS. The Sociological Quarterly is devoted to publishing cutting-edge research and theory in all areas of sociological inquiry. We look for articles that advance the discipline and reach the widest possible audience. Our focus is on publishing the best theoretically-informed empirical sociology. Since 1960, the contributors, peer-reviewers, advisory editors, and readers of The Sociological Quarterly have made it one of the leading generalist journals in the field. The Sociological Quarterly uses a web-based submission and peer review system called ScholarOne Manuscripts. All new manuscript submissions should be made through the ScholarOne Manuscripts portal here. This system has proven to be quick and convenient for both authors and reviewers, but computer errors sometimes arise. If you have any difficulties with the online submission system at any stage of the process, please email us and we will address your concern right away. -To submit a manuscript to The Sociological Quarterly, authors should access the portal here to upload the manuscript and any other correspondence. -Full help and instructions are provided on-screen. -You will be prompted for author and manuscript details and then to upload your manuscript file(s). -Please make sure your manuscript conforms to journal style by consulting the author guidelines. -Please remember that we review “blind,” so that neither authors nor reviewers know each others’ identity. To this end, please do not identify yourself, your colleagues or institution within the submitted files; instead, give your details during the submission process. -All correspondence will occur through email. -A completed submission is confirmed by email immediately and your paper will then enter the editorial process. -Your manuscript will have a unique manuscript number and you can check the progress of your manuscript at any time by returning to the author portal. -When a decision is made, revisions can be submitted online, with an opportunity to view and respond to all comments. -We rely on the generosity of our reviewers. -If you are asked to review a manuscript, but are unable to do so, please support The Sociological Quarterly by providing the names of alternate reviewers. -Reviewers will be given full instructions and access to the paper through the reviewers’ portal. -If, at any point, you have problems with the ScholarOne Manuscripts system, please email us and we will upload your review or manuscript. -Each page of the website has a brightly-colored “Get Help Now” icon connecting directly to the online support system. -Telephone support is available through the ScholarOne Manuscripts support office Monday 12:00 am to Friday 8:30 pm EST at the following US-based numbers: 434-964-4100, or 888-503-1050. -For further guidance, please consult the “Instructions to Contributors,” at the back of every issue, or the author guidelines. -If you do not have Internet access or cannot submit online, the Editorial Office will help with online submissions. Please contact the Editorial Office by email. We hope that authors and reviewers will find that ScholarOne Manuscripts makes their lives easier, leading to rapid decision-making and ensuring that the time from submission to publication is as short as possible. Interested in Becoming a Reviewer for The Sociological Quarterly? Apply to become a reviewer for The Sociological Quarterly, write a brief email of application, giving your full name; student status, if applicable; professional position, if applicable; and 3-4 areas of interest or specialization. You may include a brief list of recent publications. Send by email to the TSQ editors. 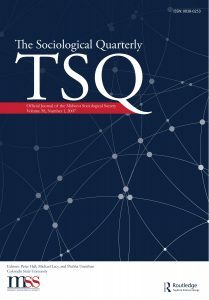 If you are a member in good standing of the Midwest Sociological Society, you are entitled to online access to The Sociological Quarterly through the Taylor & Francis Online Library. Featuring a clean and simple interface, this online service delivers intuitive navigation, enhanced discoverability, expanded functionalities, and a range of personalization and alerting options. Sign up for email alerts and RSS feeds, search for related content and click through to references. If you have not received an email describing how to access TSQ online, please email the MSS Executive Office to obtain your individual access code. Access to this online journal is for personal use only and your password and access code should be kept confidential.